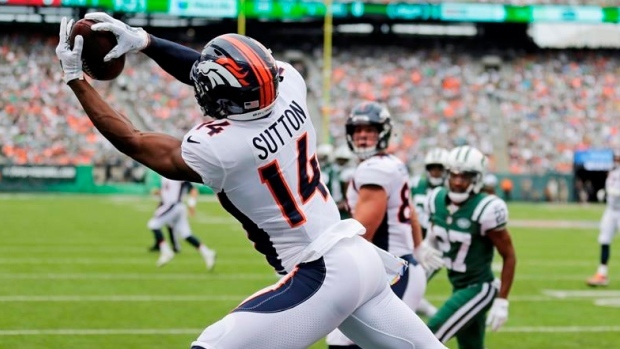 ENGLEWOOD, Colo. — With the Denver Broncos getting steamrolled by the New York Jets last week, rookie receiver Courtland Sutton turned to teammates on the sideline and vowed to play hard until the very end. He fulfilled that promise by running the length of the field to wrangle down safety Marcus Maye at the 1-yard line and prevent an end-of-game pick-6. Sutton, who caught his first touchdown pass as a pro in the first quarter of Denver's 34-16 loss, was Case Keenum's target in the end zone on the final play of the game. The ball was batted around and ended up in hands of Maye, who took off down the sideline. "I had already told everybody on the sideline there ain't no quit offensively and defensively," Sutton said. "There was no quit. We were going to fight to the end no matter what the score was. And I was going to give everything I had until the clock said zero-zero-zero." Maye chugged his way through would-be tacklers for a 104-yard interception return. "That's a pride play," Broncos linebacker Todd Davis said. "The last thing you ever want to do is let another team score." "I think everybody on the sideline knew that there was no quit in me," said Sutton, whose stop at the 1-yard line left Maye with the longest interception return without a score in NFL history. Maye, who was playing in just his second game since missing most of training camp and the preseason while dealing with ankle and foot injuries, buried his helmet in the turf after getting tackled just shy of the goal line while teammate Parry Nickerson patted him on the back. Neither Maye, who ran a total of 140.7 yards on the return, according to NFL Next Gen Stats, nor Sutton said anything to each other after the play. "Nah, I know he was tired because I was tired," Sutton said. "So, I just kind of laid there like catch your breath a little bit." Sutton's heart and hustle weren't lost on his teammates. "It shows a lot about who he is, and I really appreciate that," Keenum said. "Not just what happened on the play, but just the type of guy he is. I'll line up and go fight with those guys any day." The Broncos are going to need some resiliency as they try to snap their three-game skid Sunday when they host the Rams (5-0) . "This is a game we know we can win against a team that nobody feels we can beat," Davis said. A forecast that calls for snow and temperatures in the lower 20s might also help slow LA's dynamic offence featuring Jared Goff, who leads the league with 1,727 yards passing, and Todd Gurley, who tops the NFL with seven TD runs. "That's what we do here in Denver, man, we love the cold," nose tackle Domata Peko said. "We practiced all week in it, so hopefully these sunny LA boys come out here and see how cold it is." Special teams co-ordinator Tom McMahon said the Broncos "got lucky on Wednesday and had the blizzard, so I think the guys are ready for that. We got the same day Wednesday that I hope we get on Sunday, and we played through it pretty well." That was not a blizzard. "To me it was," McMahon said. "The snowflakes were taller than me coming down." That "was the first time I've ever played in snow," Sutton said. "It was a lot of fun. Everybody from up north they were laughing at me, telling me I needed to calm down. But I thought it was a lot of fun. I thought it was cool."